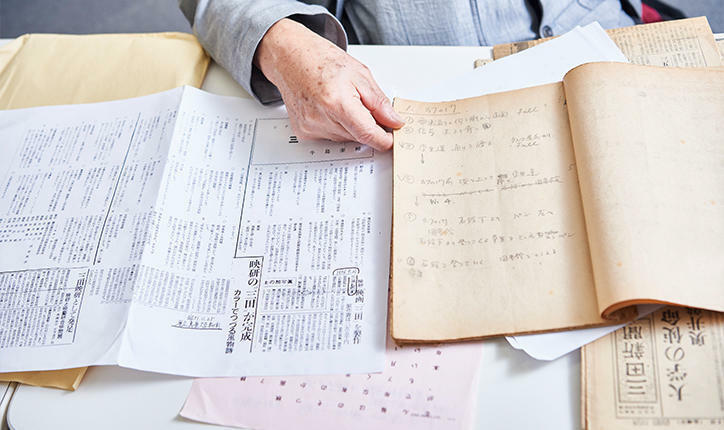 Keio University has preserved priceless color footage of Mita Campus that was shot by students more than 60 years ago. The following 8mm film, entitled Mita, was produced by 15 members of the Keio University Screen Society in 1956. Keio University Screen Society’s Mita (1965, 16 min. 54 sec.) Back then the Old University Library was visible from nearby Tamachi Station. We spoke with four former Keio Screen Society members, including Kiyosuke Ushijima, who worked on the screenplay and also appears in the film, to hear the story behind Mita. —What were movies like back in the 1950s? 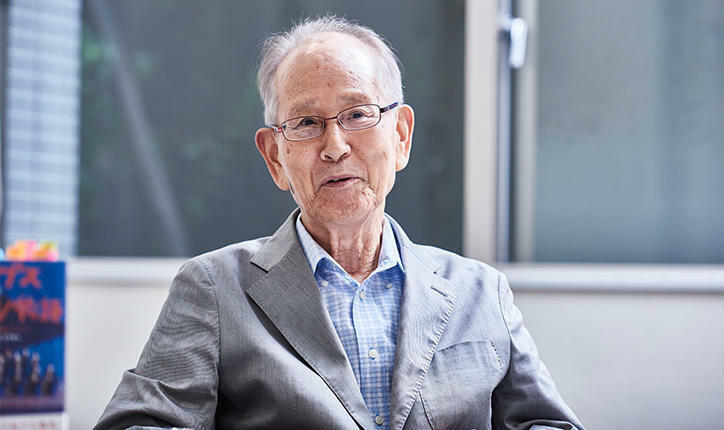 Ushijima: Well, the 1950s were the golden age of Japanese film. There were the big studios like Shochiku, Toho, Daiei, and Nikkatsu, and there was a seemingly endless parade of big stars like Yujiro Ishihara and Sayuri Yoshinaga. The industry was producing something like 600 movies a year. And so in the Screen Society, we would watch a lot of movies and received offers from studios to conduct crowd surveys at movie theaters. But by the time we were all in our third year and studying at Mita Campus, we started talking about producing our own film. —Why do you think that is? Ushijima: Out of all Japanese schools, Keio University is said to have sustained the most damage during World War II. 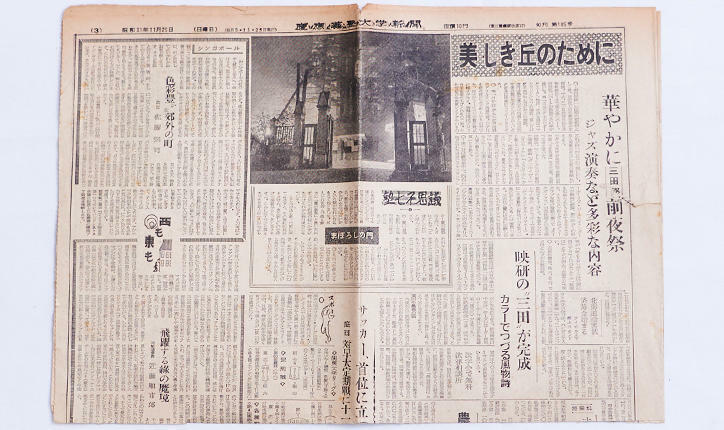 About 80% of the wooden school buildings on campus were destroyed in air raids, and the area on the left side of Hiyoshi Station’s now tree-lined street became a rubble-filled square. Many of the remaining school buildings were used as barracks for American soldiers. Most of Mita Campus was burned to the ground, too. Ten years after the war, when we first started school, Mita’s Grand Lecture Hall was still a heap of crumbling red brick and twisted steel frames. 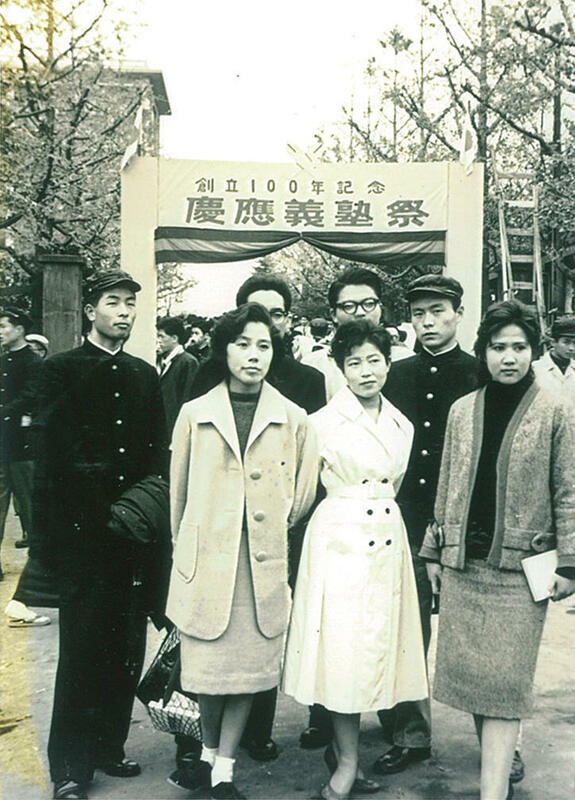 With our auditorium in ruins, entrance ceremonies, graduations, and the presidential inaugurations were held at Mita Sanjo—or Mita Hilltop Square. While that might sound fancy, it was outside and all kinds of windy. We made this movie to record our post-war plight of the Mita landscape and its students. —Were there not many places for students to relax back then? Ushijima: The cafeteria was always crowded when lunchtime came around. There was never anywhere to sit, so people were used to standing and eating. The rooms we used for society meetings were no better, either. There were only six rooms for about 80 different clubs, so we shared our room with 11 other clubs. There was a lot of pushing and shoving. On the other hand, when you left the school buildings, there was a beautiful spread of greenery. 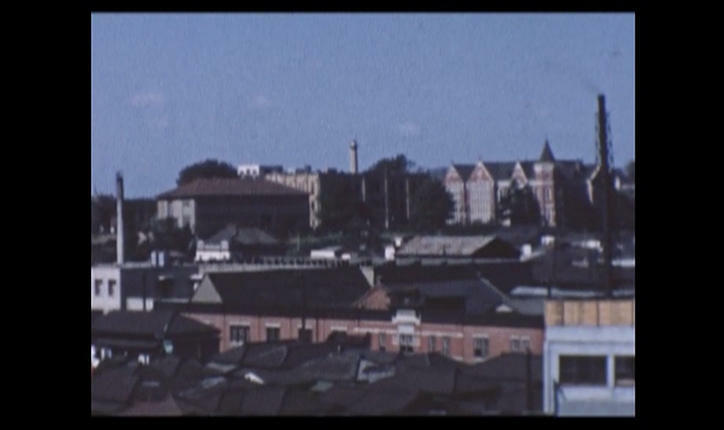 Buildings now surround the campus, but at the time, Keio really embodied its school song "Oka no Ue" (Up on the Hill). Surrounded by nature, you could see Tokyo Bay off in the distance. Just as the lyrics say—"Open the window and you can see the ocean"— the ocean felt much closer than it does now. —The film was shot in color, which makes it much easier to see how things looked. Nishimura: Black and white film was popular at the time, and color film was harder to find, so we ordered from Eastman Kodak in Hawaii. Fujifilm hadn’t been operational since the war, so there was no place to develop the color film. Mita is about 15 minutes long. We purchased and shot a total of four 8mm color film reels, each 5 minutes long— the length of the film plus one extra—and sent the reels to Hawaii to be developed. I remember that we sent the film by boat, but had it sent back by plane. 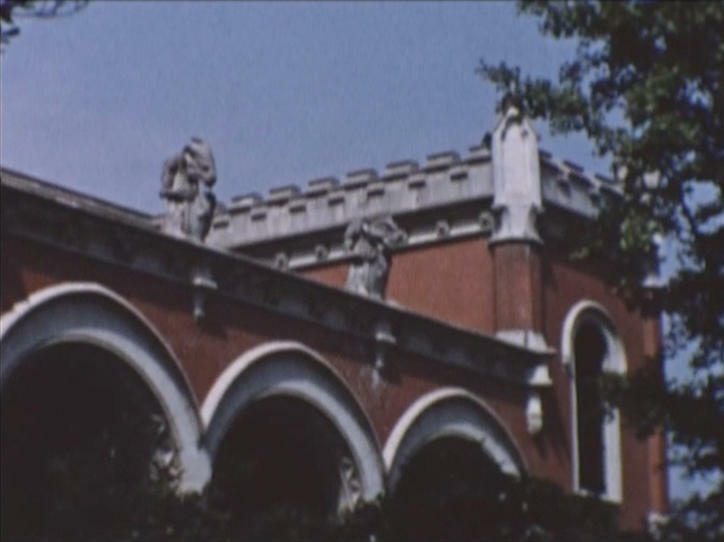 Color footage of university students in 1950s Japan is extremely hard to find anywhere in the country. 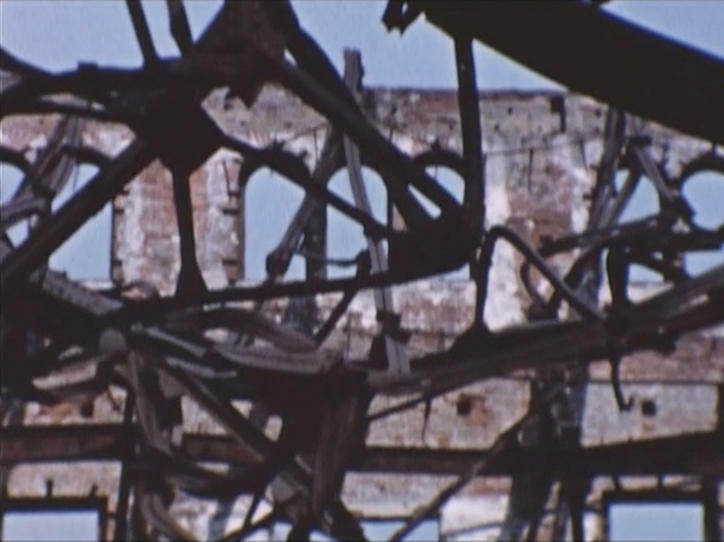 In particular, Mita is the only known color footage that shows the remains of the Grand Lecture Hall before it was demolished in 1957. I think that it has historical value as a record of the war damage. —How did you cover the production costs? I assume that it wasn’t cheap back then. Ushijima: We made the film for 25,000 yen. At that time, Keio University's yearly tuition fee was 22,000 yen, and the entry-level monthly salaries at large companies were around 7 to 8,000 yen, so it was big money for us. Of that 25,000 yen, 5,000 was donated by the Keio University Student Union (now the All Keio Student Senate), and the remaining 20,000 yen took us about a year to collect. There were two main ways how we raised the funds. One was through movie screenings. We would borrow a print from a studio, do some advertising, and then screen the movie. We would do screenings two or three times a year, charging 50 yen a ticket at a theater that could seat around 200 people. But that money only made a portion of the funds. The rest we made at a dance party. —What was this dance party? Nakagawa: Back then, dance parties hired big bands to play live for everyone on the dance floor. So we decided to hold a big dance party at Sankei Hall in Otemachi, which could hold 600 people. 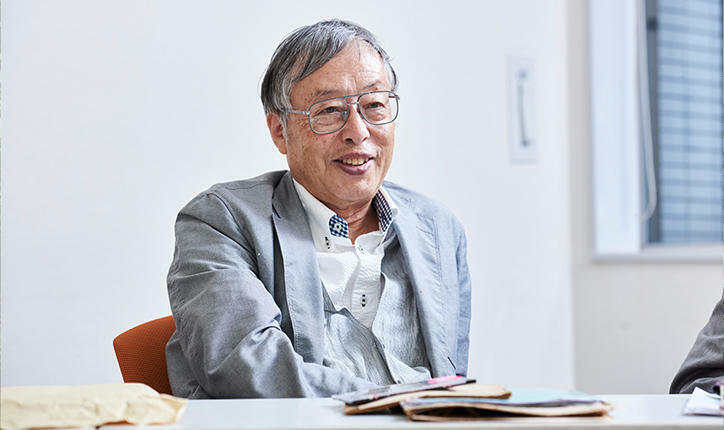 We reached out to famous big band Nobuo Hara & His Sharps & Flats and jazz band Suzuki Shoji & Rhythm Aces, who both happily accepted our request to perform. And with Nishimura, who was society president, we went to seek a donation from a former society member who was working at Nikkatsu, who agreed on the condition that we plug the company at the dance party. The recently formed Hawaiian band Nikkatsu Flower Sisters also performed and really got the crowd going. Even actor Frankie Sakai, who had also been part of the Keio Screen Society, came out. —Do you remember how many people came? Nakagawa: Tickets were around 100 or 150 yen, and we completely sold out. The place was packed, with hardly any room to move, let alone dance. Since such large parties increase the risk of fire, we had to get special permission from the fire department. There were firefighters at the parties, of course. I think it’s safe to say this now, after the fact, but I would obscure the clicker we used for counting heads when the firefighter wasn’t looking and sneak people inside. [laughs] In the end, I think we sold 1,000 tickets in all. —I know making the movie must have been difficult. Could you tell us about the process? Ushijima: We were complete amateurs when it came to movie making, so we were just fumbling around. The most difficult thing about the whole process was that there were no retakes, so failure was not an option. It wasn’t like today, when advanced editing technology lets you film any number of cuts that were impossible back then. We had to shoot everything in order, from beginning to end, according to a shot list. We also got our hands on some color film, which was rare at the time, so we were extremely motivated to make a good movie. I was in charge of the screenplay, so I wrote a three-page scenario that detailed the narration, script, and shooting locations. We shot the movie according to a storyboard I made. It listed each location and person’s movement in detail over 124 cuts across 30 pages. Our cinematographer Yuzo Kato and I shared a similar principle—that a film is only as good as its scenes and their transitions. This principle seems to have worked well for us. For example, we would slowly count to five when shooting a scene. A five-second scene meant 12 scenes per minute, or 120 scenes every ten minutes. We did our calculations to keep the film under 15 minutes, even when including moving shots and slower scenes. That was one reason why we needed a proper shot list before we started filming. —What, to you, is the climax of the film? That’s why to me, the scene of the Grand Lecture Hall ruins is the climax of our film, with its twisted, red-rusted steel frames and lonely unicorn gargoyles. The sheer rawness of its form became a symbol of the war damage for Keio. I hope students today will see this scene and reflect on the fact that Keio, too, went through turbulent times like this. —I heard you had your regrets about some parts of the film. Ushijima: Yes. I regret a decision I made regarding a scene that shows three male students who emerge from a school building. They say that they’re missing one more person needed to play mah-jong and start trying to make a male student walking behind them come and join them. The four of them, with their newly found friend, hurry off to play mah-jong. But cut to the next scene, and they are all sauntering off slowly. Even though both cuts were supposed to be one connected scene, the pacing is off. There are many times in movies when even professional directors cannot maintain consistency switching between scenes, and I’ve heard that’s why they have someone to record behind the scenes. While I was relieved to hear this, I still cannot help but feel frustrated at my mistake. Another regret I have is about the credits. 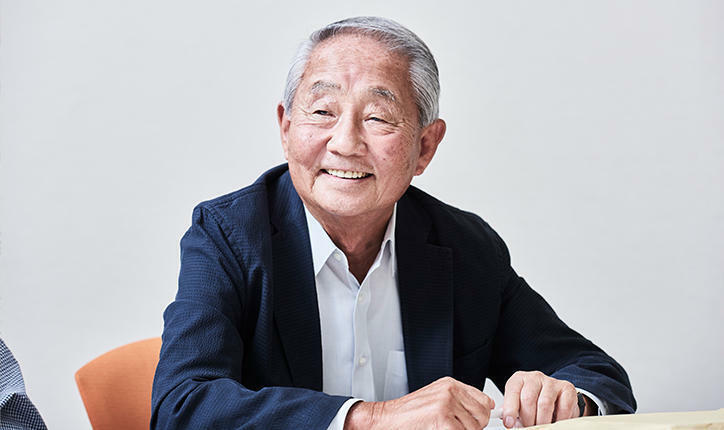 In the opening credits, we listed the names of members who helped make the film, but we forgot to include Kiyoshi Nakagawa, who was instrumental in organizing the dance party. I still feel extremely bad about that. —I heard the film was screened at Mita Festival. Nishimura: We started shooting on September 18 and spent two months filming, developing, and editing the footage and sound. The film debuted on the afternoon of November 16. At the time, the room where we showed the film was called Mita Third Classroom and could hold 50–60 people. Now this room is part of the First School Building. It was tough to show the film, too. It didn’t have sound, so we had help from the Keio Broadcasting Society to record the narration onto a tape recorder. But you have to match the audio tape with the film just right when showing a film. The timing is incredibly difficult. Tape recorders were quite bulky at the time, and it was hard to even carry them. —Please tell us how you stored the film and audio. Masaki Matsuoka: I’m one year younger than the three other individuals here, so I was left with the original footage and audio after they all graduated. Probably because I was vice president of the Screen Society at the time. I got a job and moved out to the country, forgetting the fact that I still had the film. 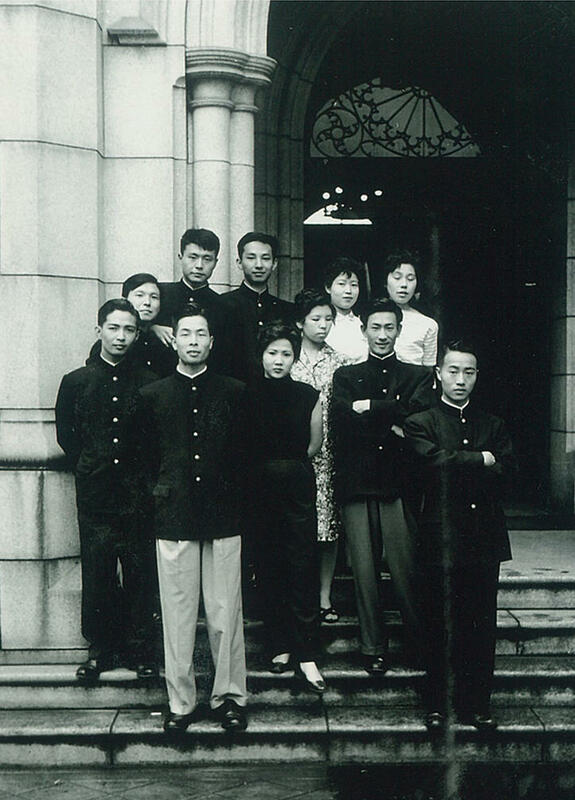 Years later, I returned to work at the company’s head office in Tokyo. One day I discovered the film and tape by accident as I was cleaning out my father’s bookshelves. I had no use for it myself, so I consulted with Izumi Matsuzawa, a fellow Keio University Screen Society alumni. He suggested that we donate it to Keio. The film had already started to show signs of aging, so I had a professional transfer the film over to VHS. Then I brought the original film, audio tape, and VHS tape to the university. This was in September 1988. 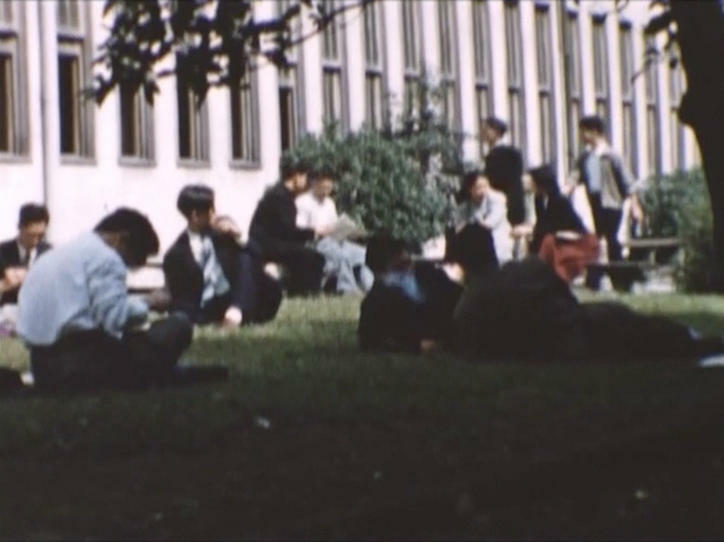 Four years later, I received a call from ABC TV, who said that they wanted to use our footage of Keio University to highlight aspects of college life in the 1950s and 60s in their program Time Travel in Moving Pictures. The show aired on April 2, 1992, with footage from Tokyo Woman's Christian University, Waseda University, and our footage of Mita. After the broadcast, ABC television sent us a VHS that had combined the video and audio. I gave a copy of that tape to Matsuzawa, who made copies for everyone in our generation of the Keio University Screen Society. The university later restored the film, so the picture is much more vibrant. The film was screened at this year’s Post-50th Reunion, where alumni who graduated 50 or more years ago gather each year. —I think many people will see your film Mita for the first time thanks to this online interview. Could you say a few final words to first-time viewers? 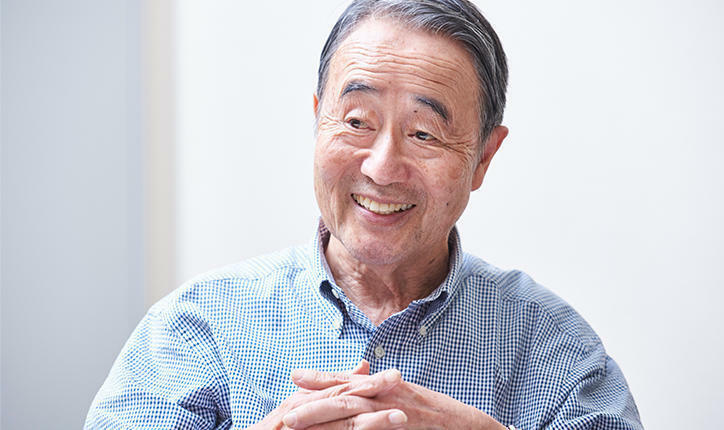 Ushijima: This is just a thought I had at the Post-50th Reunion, but I am extremely grateful for the opportunity to show this film more than fifty years after it was made. We went to such great lengths to shoot it, even managing to use color film. I think that’s why Mita has become such rare and valuable footage. I hope that viewers will marvel at the way Keio rose from the ashes after the war to be the thriving community it is today. 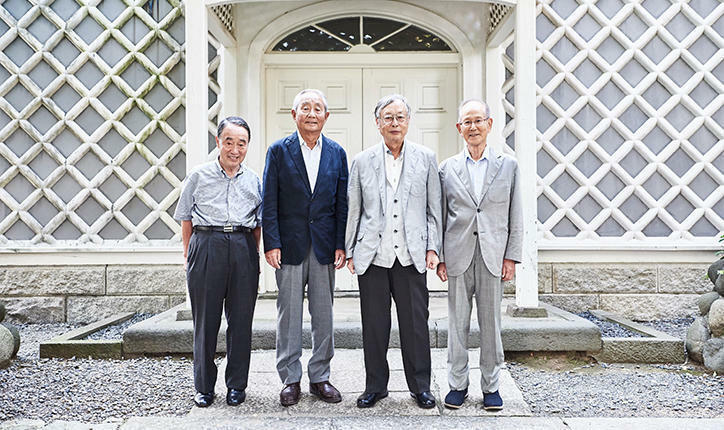 First established in 1920, the Keio University Screen Society celebrates its centennial in February 2020. 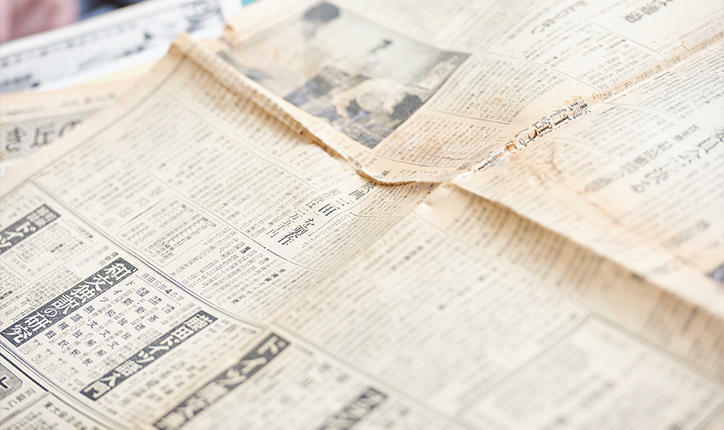 (The society’s founding was mentioned on February 11, 1920, in issue 22 of the Kinema Junpo, commonly called Kinejun, Japan's oldest film magazine.) 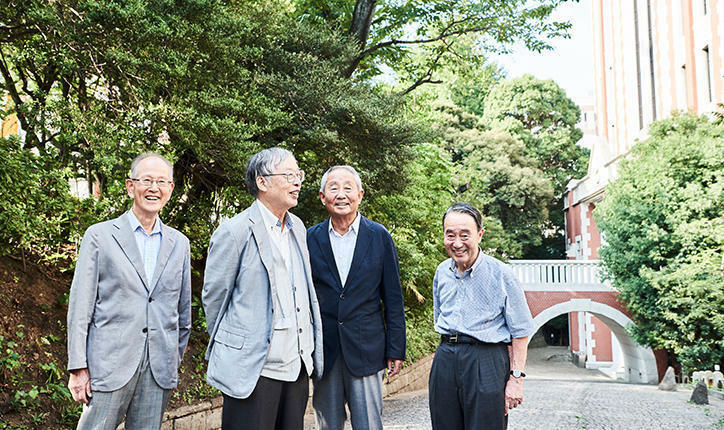 Alumni have maintained their friendships long after graduation, and they still get together from time to time even as many members are now well into their 80s.